You came to the site. You learned about the nonprofits. You read the stories of specific children. You bought books, backpacks, blankets, and empowering toys... thousands of them. The biggest two surprises: We had donors from every single state, and every child uploaded by our nonprofit partners received gifts. Internally we discussed these as moonshots; you made them realities. The craziest part: over 600 kids were sent gifts in the last two days of giving alone. During the last push, there were extended periods where we averaged a gift a minute. And special shoutout to donors from Australia, Czechia, Denmark, Finland, Spain, the US Virgin Islands, Great Britain, and Scotland. We’re pretty darn excited about the gifts on this year’s platform. This afternoon a young girl might have unboxed her Goldie Blox set and thought up an entirely new idea. And tonight, the words of Dr. Seuss will fill hundreds of bedrooms before lights out. These items were filling needs, creating smiles, and helping build a better future. As some of you may know, we made a last-minute trip to the West Coast to make sure every gift made it in time. It was amazing to hold these items in our hands, knowing that you had sent them and knowing how many little hands would hold them, play with them, learn from them. 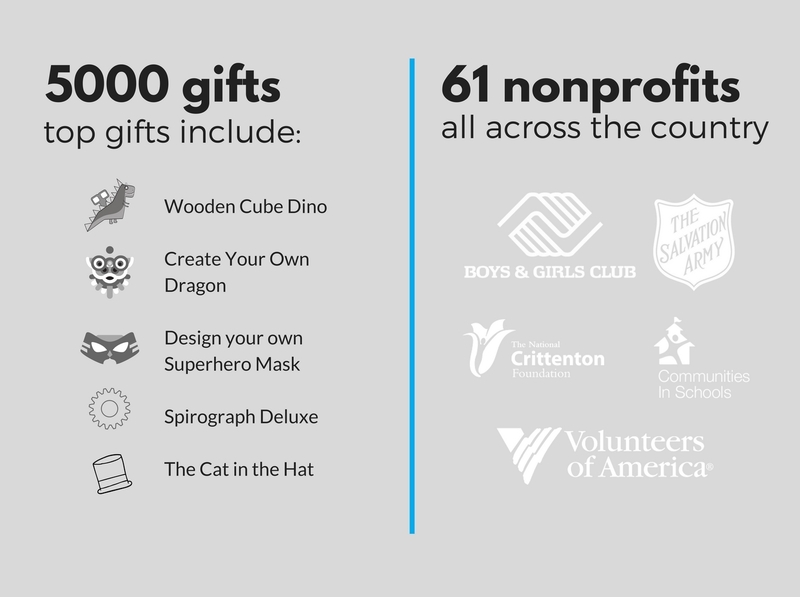 We worked with 61 of the best nonprofits from around the country to facilitate the giving. These ranged from one of the West Coast’s largest organization to a small women’s shelter in Charlotte, NC. We're honored to play a role in supporting the amazing work these organizations do. Now... this is something that gets a few of our team members really excited--the data. This holiday season, we saw a 31% conversion rate. This is the percentage of people that visit the site and end up purchasing an item. The industry average in online giving is somewhere between 2 and 4%. Every gift, every smile matters so much. We love that donations ranged from a $5 Magic Tree House book to a $1700 donation that completed 13 wish lists. We also saw $34,000 in purchases from social shares. You came to the platform, donated items, and then told all of your friends on Facebook, Twitter, and Instagram. Topping it all of were the stories we heard from you. One corporation (with offices in Philly, LA, and D.C.) went head to head to see who could do the most giving. Each office met their goals a few days before the window closed, so they doubled the goals and raced to the finish. "I was young when I first encountered humanitarians, I thought it was just a game trading cans of food in the brown bags of food they provided. Instead I realize much later in life they were gifts of the church for the hard comings our parents were going thru. I now have a 10 month old, and I pray we do not have as hard comings as my parents did. I feel relief there are companys like yours that allow us to help in some way. You remind us that there is goodness in the world. That's the world I will teach him about. Thank you and happy holidays!" We heard from moms, dads, kids---and their grandparents---each with their own holiday story. Thank you to the four-year-old who saved up to bring holiday cheer to someone less fortunate. Thank you to the couple who sponsored kids online after 40 years of doing so offline. Thank you to each and every one of you. We’re thrilled to take CommuniGift Birthdays national, giving children the opportunity to help other children who share the same birthday by inviting their party guests to give back while RSVPing. We’re planning to introduce a couple other ways for you to help these same kids throughout the year--with a focus on holidays and school supplies. Most importantly, we’re continuing to build a giving experience we hope you absolutely love. We believe there’s something special around helping others; we want to make that as simple and as meaningful as possible.